Endroit de recherche : J'habite dans le region de Gatineau/Ottawa. Je suis disponible n'importe quel jour de la semaine. Je suis disponible du coté Quebecois et Ontarienne. I live in the Ottawa/Gatineau region, I am available anytime. I can search in the Ottawa Valley. Cout de mes services : . Je travaille sur une base de récompense seulement si l’objet est trouvé. Le seul coût que je demande est pour mon déplacement. My service is on a Reward Only Basis only if found. If the item is not found a $ 30 call out fee for fuel and vehicle expenses would be appreciated. Please note that my call out fee is subject to change depending on travel distance. Style de recherches : Les plages, parcs, lacs, et la cour arriere. J'utilise un détecteur de metal haute gamme, et peut faire les fouilles a la surface comme dans l'eau et sous l'eau. Je suis un plongeur certifier. Je peut plonger jusqu`a une profondeur de 6 pied. Je suis plongeur certifier depuis plus que 15 ans et j'ai fait parti d'un equipe de plongeur de secouristes, aujourd'hui je ne fait aucune recherche de secour et je fait que plonger pour le plaisir maintenant. Je fait du détecteur de métal depuis plus que 7 ans et plonger avec mon detecteur de métal depuis 2 ans. Je suis accro a ce passe temps et apres avoir parler avec Mr Chris Turner et ce qui offre aux gens a retrouver leur objet de valeur..ceci ma fait ouvrir les yeux et c'est la que j'ai pris la décision de me joindre a sont equipe et offrir les memes services ici dans la region. Aidez les gens et retrouver leur objet de valeur que eux pensait avoir perdu pour toujour ...et maintenant ma seule passion. Ce que fait Chris et sont equipe est incroyable et faire parti de sont équipe c'est un honneur ! Merci ! I have been a diver for over 15 years also did search and rescue, although I no longer do the S & R, I only dive for pleasure. I've been metal detecting for over 7 years, and underwater detecting the past 2 years. I am addicted to this passionate hobby, and after speaking with Chris Turner and what he does to help people out opened my eyes and wish to do the same thing and be part of his team. Helping people recover and return their most sentimental items that they thought was lost forever is what I love to do. What Chris is doing is incredible and being part of his team, is an honor ! Thanks to Stephane with all my heart! 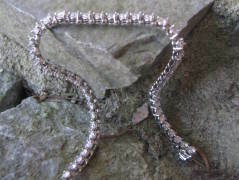 Less than 2 years ago my husband bought me a beautiful gift – a diamond tennis bracelet. It is one of my most treasured possessions. It makes me smile every day when I wear it. I walk in the woods every morning with a friend – a half hour brisk walk around a trail. I wear my bracelet all the time, because I love it. Wednesday morning I realized, an hour after I got home, that I did not have it. I remembered taking my mitten off a few times to fix my hat – and my heart sank as I realized it probably fell off on the trail. I immediately went back out – walked the trail at a snail’s pace with my eyes down, to no avail. I had to do some work but went out later that day and spent three hours – taking one step – looking from left to right – to no avail. I felt so down. It is a long trail, in the woods, lots of animals, people and birds. A google search unveiled Stephane Phillipe, with Ring Finders. I called him the next morning – he agreed to come the next morning. As we headed out on the trail my hopes were up. After three hours – and ¾ of the way around – I was starting to tell myself to prepare for the worst. It was then that Stephane announced “I have it!” and sure enough – he found it with his metal detector and his eagle eye saw the glistening – it was on the trail, stepped down into the snow – probably by the many dogs and people who passed by. Stephane is a delightful man. Very professional, very knowledgeable, kept asking me questions to try and help the search. He was very careful, and took his time, was clearly on a mission. And, because we were walking slowly, around a long trail, we had lots of time for delightful conversation. He is a genuinely caring person, very honest, has the kinds of values that are so important in our world today. And he sounds like a delightful Dad. Needless to say I am over the moon with happiness. Thanks Stephane! You are a special man! I just wanted to write to you to say thanks for finding my lost wedding band. After melting 8 garbage cans full of snow trying to find my buried ring, I did not know what else to do. Calling the Ring Finder at 10pm on a friday night seemed to be a crazy idea. But to my surprise, you answered and not only came out to my place the next morning with your hi tech equipment, you managed to find my ring buried in a snowbank in about 45 seconds!!!! Your service made an unbelievable amount of stress go away almost instantly. Professional, quick, and courteous you were. I would not hesitate to recommend your service to anyone who has had the misfortune of loosing a valuable item. 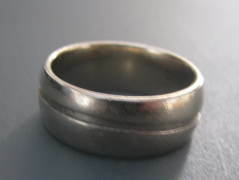 We want to take this opportunity to thank you for finding Darryl's wedding ring. No words can express our appreciation for all your efforts. You were right that we were in good hands when we called for your help. 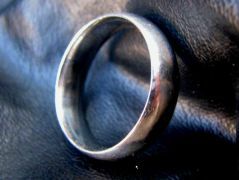 We never thought that the ring would found when lost on a hunting trip in the bush. It means so much to us both as it has sentimental value as we had just recently got married three months ago. Darryl is now out of the dog house. :) We will recommend you to anyone that has lost jewelry. Just before Christmas, I was cleaning out the back seat of our car before taking neighbours to the airport. I took my gloves off, gave the seat a few brushes to get rid of some dog hair, and -- in one perfect motion -- knocked my wedding band loose and launched it into the snow. We had three sets of eyes looking for this ring in the first half hour, and my wife and I continued to look with no success for a few days. We called on Stephane Philippe from The Ring Finders, who took time out of his Boxing Day and was extremely friendly and professional. 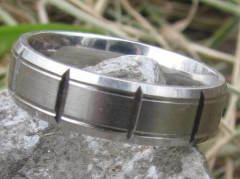 Stephane came over with some sophisticated equipment, and -- despite significant interference in the yard, including buried nails, power lines, and a water main -- was able to identify and recover the ring within a short period of time. 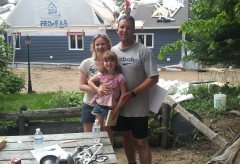 We are grateful for Stephane's help, and glad that he takes a portion of the rewards to help worthy causes in our area. As I raked the leaves on our front lawn in October, my engagement ring and wedding band slipped off. I noticed and put them back on. I thought, I should be wearing gloves while I do this but hey, I just noticed so it should be okay. As I fed my son supper, I noticed that my engagement ring wasn't on my finger. After over 6 years on my hand, it was gone - I had to find it. After putting our son to bed, my husband and I did our best to light up the garage as we sifted through the leaves that had been collected and went over the lawn. After an hour plus of searching with no results, we started to consider our options. We knew that the longer we waited, the less chance of finding it. My husband found Stephane's information and I spoke with him from work the next day. Stephane was so responsive - coming to meet me at home at the end of my work day. He started searching immediately. 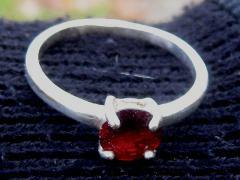 Stephane found my engagement ring in one of the bags of leaves. I felt such relief when it was found! A huge thank you to Stephane! I recommend Stephane to anyone who needs help finding a ring! We had found this ring on a recent trip to California . It was a perfect little souvenir from a local artisan from that great part of the world. When it went missing we felt a little empty, wondering if we'd ever find something similar - that's when we called Stephane. He was very professional and accommodating for our schedule. When Stephane arrived, we instantly felt confident that the ring would reappear due to his can-do attitude, modern equipment and self-confidence. And sure enough a few minutes into the search - it was found, with Stephane holding up a muddy ring and quietly announcing, "Here it is." We felt relief and lots of joy in being re-united with this piece of art found in a small shop in San Francisco.